I’ve seen the adverts about packing in more at lunch time with KFC Burritos and decided to play along. There is a KFC opposite where I work, so Spectre and I decided to treat ourselves on a lunch work break. 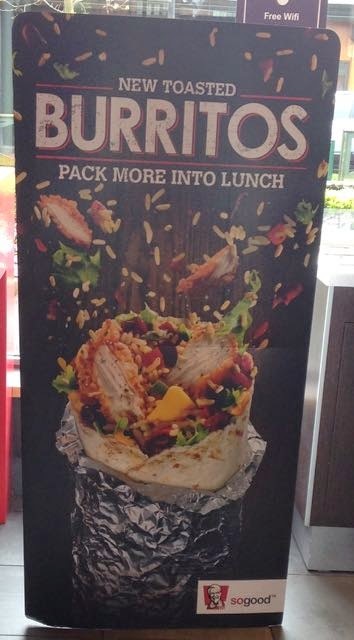 I think the idea from the advertising campaign is that you can grab a Burrito and go, but I didn’t fancy lunch at my desk so we ate in. Spectre sneakily ordered himself a variety meal (with extra hot wings), not wanting to miss out on the opportunity to eat his favourite KFC lunch. Mister Adventure! I stuck to the plan at least and ordered the Burrito meal, I went for the Original Recipe variety for a first try. The Zinger version did sound lovely, but I though the Original worked better as a starting point. 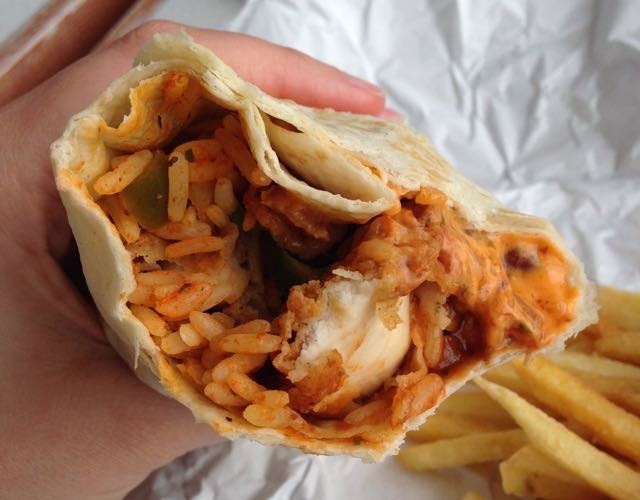 My Burrito came rapped in foil, and as part of the meal deal with chips and a sot drink. I carefully unwrapped it and realised that there was nowhere for the filling to fall out as it was neatly wrapped in the Burrito. I quick bite in revealed the goodies. There was all sorts in with the chicken, rice, beans and a spicy tomato salsa. I loved the mix of flavours, and textures. I’ve discovered writing this blog that a mix of textures works really well for me. Soft Burrito, rice and the firm chicken meant I found this a pleasure to eat. 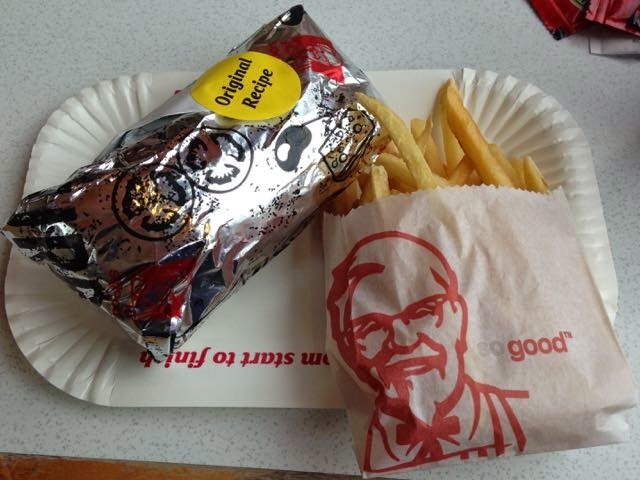 I liked that the chicken still had the distinctive KFC flavour, but that you could taste all the other ingredients too. The Burrito was surprising spicy in places, there must have been the odd bit of hot chilli in the salsa that gave a pleasing tingle. I can’t wait to go back and try the Zinger version. I had a half an hour lunch break and my walk to and from KFC, the ordering and eating of this took up exactly the thirty minutes. I’m not sure this was packing more in as per the advert, but it was a really nice weekday treat.